From left are William C. Herbert III, Michael Welch, Cailley Bonti, Sheldon Tepler, Christian Lewis, Leana Amaez, Stacy Stitham and Nan Heald at the Pine Tree Legal Assistance reception in Lewiston. Hardy Wolf and Downing is here to help Mainers injured in car accidents. We don’t represent corporations or insurance companies. And we know that many people can’t afford to pay for a personal injury lawyer up front. So we simply don’t charge a dime until the client gets paid for the suffering she’s endured. But, our desire to help those in need goes even further. Many Mainers can’t afford lawyers for other legal matters. That’s where we step in. Hardy Wolf and Downing has an unequaled record of giving Mainers in need legal help for free. This is called pro bono legal work–just a fancy Latin name for helping those who need help and can’t afford a lawyer. We have just begun a program of pro bono help that is groundbreaking and unique for Maine. Hardy Wolf and Downing has hired a full-time lawyer at our expense, but she will only work half of the time in our personal injury practice. The other half of her time is dedicated to helping Mainers in need of legal services who can’t afford them. She will spend that time at Pine Tree Legal Assistance’s Lewiston office. The Maine legal community has taken notice of our efforts. 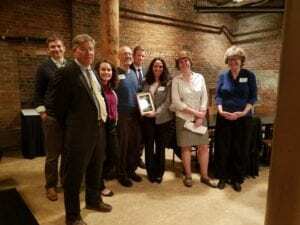 The Pine Tree Legal Assistance Board honored our firm with the Commitment to Justice Award. That award stands for contributions made towards the goal of justice for all. We believe all Mainers should share that goal. We put our money and work where our hearts are to achieve that goal. Hardy Wolf and Downing is among the very top successful law firms in Maine. We have gotten well over $200 million for injured Mainers. But we never forgot that our ultimate goal is helping people, whether or not they can afford to pay. We believe in doing well by doing good. The firm’s President, Sheldon Tepler was also recognized by Pine Tree Legal Assistance for career-long dedication to pro bono work and advocacy of for those who deserve fair and skilled legal representation. He was presented with Pine Tree Legal Assistance’s Individual Pro Bono Award for his enthusiasm, diligence, and time spent on cases and individuals in need of legal aid. Learn more about the great work our attorneys have done in the community by visiting the Attorneys page. For more information about the recent awards that our personal injury firm has received, see this Sun Journal article or the Maine Insights write up. If you’re looking for a personal injury lawyer in Maine, contact us!